I started writing A Bitter Pill to Swallow when I was taking a creative writing class at Northwestern and will be going back to where it all began when I sell signed copies at the Evanston Literary Festival Book Fair this Saturday. It's a great opportunity to meet local authors and learn more about literary organizations and small presses. I am excited to be a part of this year's Chicago Young Adult Book Festival. Come and get your copy of A Bitter Pill to Swallow signed if you haven't already, and meet some other young adult authors while you're there. Admission is fee but tickets are required. Please RSVP here. I will be reading an excerpt from A Bitter Pill to Swallow at Hopleaf's Tuesday Funk live lit event. Doors open at 7 pm (no earlier, but arrive as close to 7 as possible or risk not getting a table) and the show starts at 7:30 pm. Admission is free, but you must be 21 or older. Please RSVP on Facebook. Reception & book signing to follow afterwards at The Book Cellar at 5 PM! Visit bookcellarinc.com/event/cyabookfest2017 for more details! 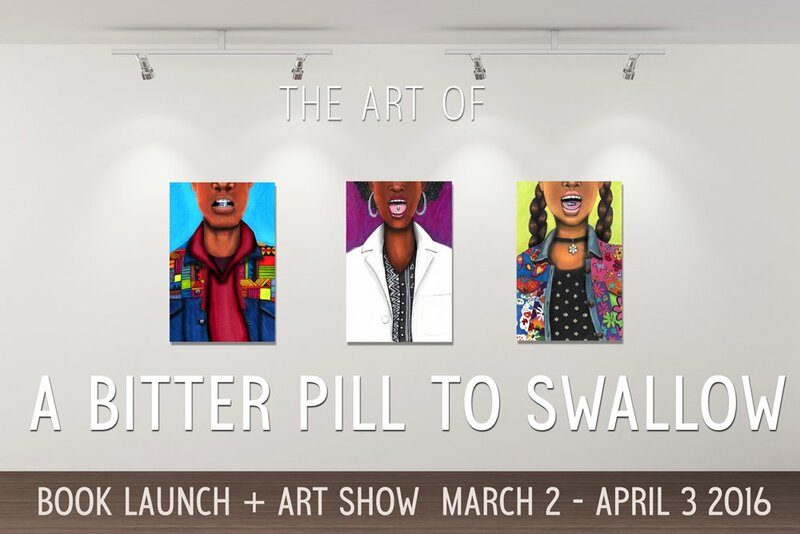 Get a signed copy of A Bitter Pill to Swallow at the first annual Black History Month Book Fair. Get a signed copy of A Bitter Pill to Swallow at the first annual Soulful Chicago Kwanzaa Book Fair. Get a signed copy of A Bitter Pill to Swallow at the Hyde Park Handmade artisan bazaar. Hyde Park Handmade is free and welcomes all-ages. I will be at the Chicago Black Authors Network booth during the Printers Row Lit Fest. You can buy a signed copy of A Bitter Pill to Swallow there, and pick up a free bookmark and pin while supplies last. You have a second chance to celebrate the book launch! Free and open to the public. See and purchase artwork designed by the author to accompany A Bitter Pill to Swallow, buy a signed copy of the book, and stay to hear the author read excerpts. Free bookmarks and buttons while supplies last. Light refreshments will be served. *Take the elevator to the second floor. Free and open to the public. See and purchase artwork designed by the author to accompany A Bitter Pill to Swallow, buy a signed copy of the book, and stay to hear the author read excerpts. Light refreshments will be served.